The Milford Track is known as ‘the finest walk in the world’ and is perhaps the most famous of the nine New Zealand Great Walks. Experience the stunning grandeur of Fiordland National Park and be awed by its natural wonders: sheer ice-carved valleys, mountain passes, refreshing glacier-fed rivers, peaceful forests and cascading waterfalls. The Milford Track takes four to five days to walk and is 53.5km (33.24 miles) long. The start point of the Milford Track is Glade Wharf at the head of Lake Te Anau. From here the track traverses some of Fiordland National Park’s most beautiful scenery: native rainforests, glacial valleys, alpine passes, wetlands and waterfalls. The end point is at Sandfly Point, a short boat ride from Milford Sound. To start walking the Milford Track, hikers need to arrange boat transport from Te Anau Downs to Glade Wharf to get to the start of the track. A short walk through native forest takes you to Clinton Hut, where all walkers spend their first night. The track follows the Clinton River up to the base of the Mackinnon Pass and Lake Mintaro, through ice fields and rocky valleys and past beautiful waterfalls. Stay the night at Mintaro Hut. This is the most difficult day of the hike, climbing up and over the Mackinnon Pass and down through alpine valleys to the Roaring Burn River. You can visit the famous Sutherland Falls on a side track from the Quintin Shelter – this is worth the effort. High in the mountains of Fiordland National Park, Lake Quill is encircled by rainforest peaks, with a sheer cliff on one side where the Sutherland Falls escape and thunder 580m down to the valley below. Stay the night at Dumpling Hut. The last day of the Milford Track follows the Arthur River along to the historic Boatshed hut – here, row boats used to ferry walkers over the river, but there’s now a swingbridge in place. You’ll also see the impressive Mackay Falls and the fascinating Bell Rock – an enormous boulder that has been hollowed out over time by the powerful waterfalls and then turned upside down. The track ends at Sandfly Point, where you can take a boat ride to stunning Milford Sound – your reward for completing one of NZ’s Great Walks. 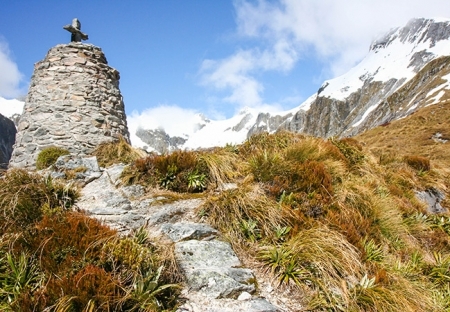 The Milford Track season runs from October to April. Bookings are essential, as only 90 people can start the walk each day and places frequently book out. The track is well-maintained during the season by the Department of Conservation (DOC) and there are three comfortable serviced huts with bunk beds along the way. There are also some private huts and lodges. Camping along the Milford Track is not allowed. During the winter months you can still walk the Milford Track; however there are flood and avalanche risks along the route and track facilities are reduced. Because of the cold, wet and snowy conditions in winter, only experienced hikers should attempt the walk in the off-season. You can walk the Milford Track independently and book the huts yourself, or book a guided tour with meals and accommodation included if you prefer. 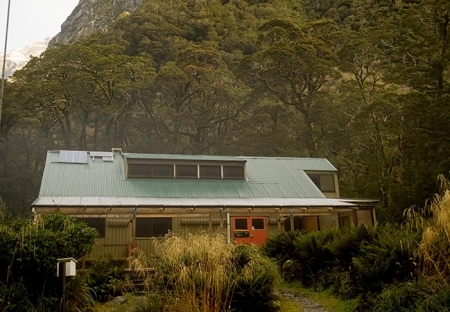 You can see a list of companies offering Milford Track guided walks here. In all seasons you should prepare carefully for walking the Milford Track. You need to bring all your own food, sleeping gear and equipment. Wear appropriate hiking footwear and bring plenty of warm and waterproof clothing. Even in summer, Fiordland is one of the wettest parts of New Zealand and temperatures can still be chilly. At the end of your Milford Track experience, take a cruise on the fiord before returning to Te Anau or Queenstown. A popular option for getting back to Queenstown after the Milford Track is the bus. Buses from Milford Sound depart daily in the afternoon. You can book one way travel from Milford Sound to Queenstown or Te Anau through the InterCity website. Find out more about buses from Milford Sound.